Released this past summer, MartinLogan’s Motion Vision aims to fill a small-but-significant gap in home theater offerings: the “high end” soundbar. There are very few products in this category and understandably so. If you have over $1000 to spend on a sound system, why not just go with a multi-speaker set-up? The vast majority of people will do just that. But not everyone can. Some rooms simply can’t be outfitted in such a way. Outside walls, lots of windows, inadequate crawl or attic space — these are things that can hinder speaker installation throughout a decent-sized room. Or maybe the room just has a nice charm you don’t want to ruin with a multitude of speakers. Also: If you could get outstanding 5.1 channel “surround” sound from just a single $1500 bar, it could actually be a good deal. You wouldn’t need an A/V receiver. You wouldn’t need to pull cables through walls. Assuming you’ve already got a decent TV (with multiple HDMI inputs), you can use your TV as the receiver and simply plug the soundbar into your TV’s digital audio out port (which is becoming standard on decent HDTVs these days). No extra components. No need to hire an A/V installer. You might not even need a universal remote. None of that. 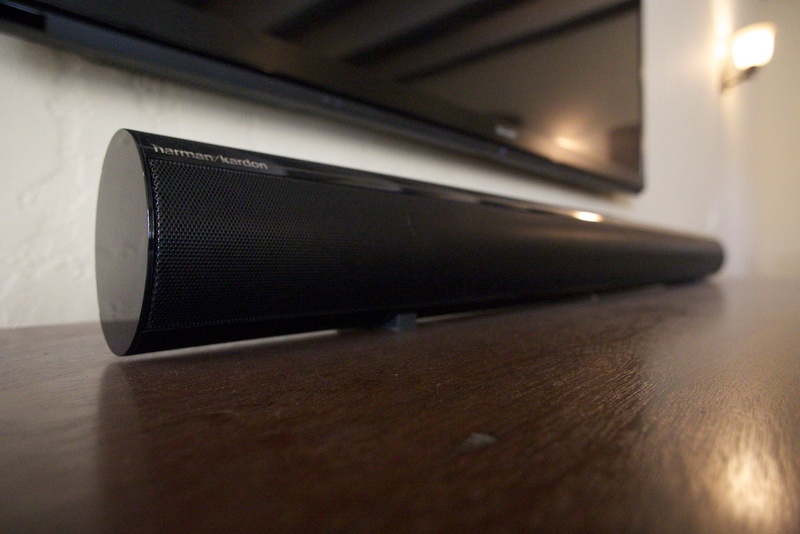 Which brings us to the $1500 question… Is the Motion Vision that soundbar? My client’s living room is a little over 20 feet x 15 feet. That’s either large or medium sized depending on where you live. In a big city like Los Angeles, it’s actually a nice-sized room, especially for a room solely dedicated to entertaining and nothing else. It’s got two outside walls, lots of windows AND a charming mid-century Mediterranean look the client’s wife didn’t want to alter. So the room definitely fit the bill for a soundbar, and powerful one at that (to fill the space adequately). The Bowers & Wilkins Panorama and the Definitive Technology SoloCinema XTR were both out of the client’s price range (each runs over $2000). Also, they were kinda ugly. So, after reading some glowing reviews — here, here, and here — I recommended the Motion Vision. The first thing you notice is how striking it is to look at. It definitely looks like a $1500 piece of equipment, at least compared to other speaker systems. But does it sound like $1500? Our first test DVD: The Blu-Ray for Will Ferrell’s Talladega Nights. Why a comedy, you ask? Well, for one — it’s not just a comedy. It has several racing sequences that can really test a system’s ability to handle action. And secondly: Sound is actually pretty important to comedy, especially for a slave-to-detail like director Adam McKay. For all the over-the-top gags, there’s just as much humor found in the nuance of individual lines. Our first reaction: It sounded FANTASTIC. Out-of-the-box, the sound was rich and full-bodied. The race car engines revved like they did in the theater. 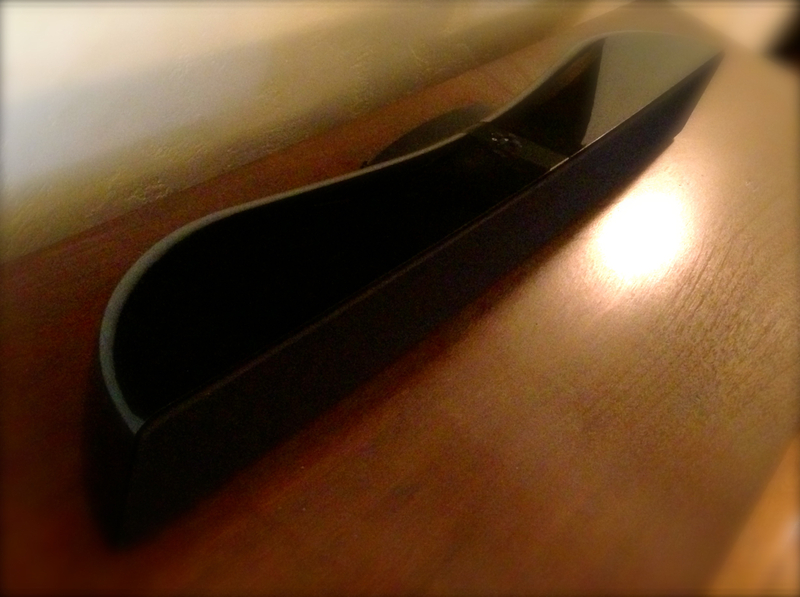 For a soundbar with no external subwoofer, the bass was more than enough. But something odd kept happening. On more than one occasion, I’d have to ask: “What’d that guy just say?” Occasionally muddled dialogue is par for the course with movies featuring thick accents and lots of background action — but with the Motion Vision, just about any overly-deep, overly-raspy voice sounded like a character in a Guy Ritchie film. I tweaked and tweaked the soundbar, but no matter how I adjusted the settings, mid-range dialogue sounded either a little muted (compared to other sounds) or too breathy. I had to turn down the overall bass down a lot just to get the dialogue to sound the way I wanted it to (not an ideal solution if you like bass and don’t have an external subwoofer). Note: The dialogue sounded better coming from a DTS source than a Dolby Digital source, but if you’re planning to use your TV’s digital out port, DTS likely isn’t an option. Now, other people who listened to this soundbar didn’t mind the breathiness of the dialogue. In fact, the amount of “depth” to the dialogue might even be considered impressive to some (because “tinny” voices are a sign of low quality). Personally, I’d gladly take a little tinniness if it came with a bit more clarity. So if you plan on watching as many dialogue-heavy costume dramas as you do action films, this might not be the soundbar for you. For the client, the dialogue issue was actually forgivable. And I have a feeling this is a common complaint among soundbar technology in general. But there was a glitch that we couldn’t overlook. The Motion Vision has an “auto-off/auto-on” feature. At least, it’s supposed to. I wanted to set it up so the client never had to turn on or off the soundbar, so this feature was something I liked a lot. On paper. In actual practice, it didn’t work right. Every time the Motion Vision turned itself off (to save power), the next time it turned itself on again (whenever it sensed a signal coming from the TV), it defaulted to the wrong audio source. I tried this with two different units and both had the same defect. So basically, if you intend to use the auto-power feature to reduce the need for a 2nd remote (or to keep from having program a macro into a universal remote), the feature is worthless. Every time the system turned on, you still had to manually switch over the right source input. Very annoying. I had to turn off that feature and program a universal remote so that it turned on the soundbar manually with the TV. Not the worst solution in the world, especially if you were already planning to use a good universal remote anyway, but I was really hoping to set-up the system so that it didn’t need a universal remote at all (because the TV and Blu-Ray player were the same brand, and because apps like Netflix and Pandora are baked into the TV itself). Conclusion: We returned the MartinLogan. But it was a tough decision. The thing was beautiful. For the most part it sounded EXCELLENT, but the dialogue got a little lost under certain circumstances — just enough that I thought the client could save money and get a less expensive sound bar that wouldn’t be any worse in that area, and maybe even a little better. The client wound up getting the Harman Kardon SB30 (currently retailing for just under $800). Overall, it’s not as “substantial” a sound delivery system as the MartinLogan — music especially doesn’t sound as good — but for movies it does hold its own against and even does better than the Martin Logan in a couple areas. Dialogue tended to sound crisper and the SB30’s simulated surround sound worked much better i.e. it has a wider sitting area to get the full effect, and the effect itself was more profound (though still nothing compared to actual rear speakers). It also saved the client nearly $700, which is always a good thing.